As ThePrint travelled from Tezpur to Golaghat and Jorhat, it found national security is not an overt poll issue but voters were not indifferent to it. 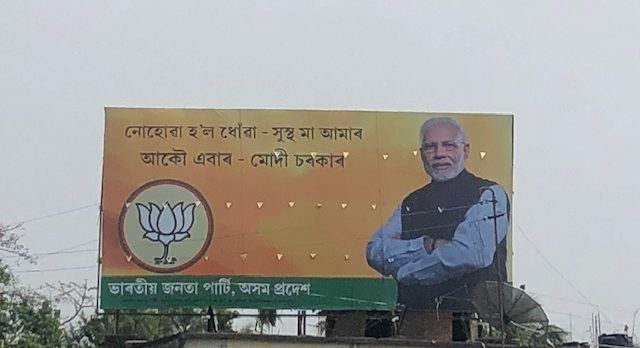 Tezpur, Golaghat, Jorhat: The Bharatiya Janata Party (BJP) has been looking to centre the poll discourse, ahead of the Lok Sabha elections, around issues of national security, with Prime Minister Narendra Modi and party president Amit Shah time and again referring to the Balakot air strikes in their campaign speeches. On the ground in Assam, however, the issue of national security and the Balakot strikes are playing out in a complex manner. For several voters in the state, national security is not overtly a key election issue and they say it should not be one either, but at the same time, they are anything but indifferent to it, emphatically appreciating the “uttor (reply)” given to Pakistan when the topic is brought up. Both Modi and Shah have been holding rallies in various parts of Assam regularly, making noisy references to the Balakot strikes. At a rally in upper Assam’s Dibrugarh last week, the PM claimed while the whole country appreciated the Balakot strikes, the Congress did not. Shah, meanwhile, addressed a rally in Kaliabor and said that “only Modi and BJP can protect the country’s borders”. But as ThePrint travelled from Tezpur in central Assam to Golaghat and Jorhat in the upper part of the state, it found most did not even mention Balakot or national security at first when asked what issues matter in this election, choosing instead to talk about welfare schemes, development, Congress regime versus the BJP years as well as the Citizenship (Amendment) Bill. However, when asked about Balakot, they were enthusiastically appreciative of it and said the response to the Pulwama terror attack “was appropriate”. The BJP believes that while not on top of voters’ minds, the issue could well be shaping voting preferences at a more discrete level, given the appreciation towards the Modi government’s actions. The government’s ‘muscular approach to Pakistan’, retaliatory strikes on terror camps in Balakot and national security as a whole are not being cited as the main issues by several voters in these elections, even by those who want to re-elect Modi. “Modi has done a lot. He has given us roads, gas connections, houses. There has been all-round development,” said Tezpur’s Nabojit Deka. When asked about Balakot and its constant reference in speeches, Deka said while “revenge was needed”, it was not an influencing factor in elections. Deka encapsulates the complexity and nuance of the voter sentiment here. Pranjal Dutta of Pulibor village in Jorhat agrees. “This can’t be an election issue. In elections, issues such as the prices of essential commodities, roads etc are what matter,” he says. He is, however, quick to add he will vote for the BJP and how “India gave a befitting answer to Pakistan”. Most voters ThePrint spoke to did not bring this up on their own. “I support BJP because I am satisfied with their work on the development front and because Congress did nothing in its years in power,” says Biju Pradhan in the outskirts of Golaghat. He, however, added that he supports the Congress “since Modi talks more and performs less”. Some, meanwhile, believe voters are discerning enough. The BJP, meanwhile, feels that “at a sub-conscious level it helps cement Modi’s image as a decisive and strong leader”, and is hence, adopting a top-down rather than a bottom-up approach. In Assam, the BJP is a relatively new force, coming to power in the state for the first time in the 2016 assembly polls. Of the 14 Lok Sabha seats in the state, the party has seven but hopes to increase its tally this time. The last few months, however, have been uncertain for it given the stiff resistance to the controversial Citizenship (Amendment) Bill, with the party being at the receiving end of the ire of the ethnic Assamese. The party has adopted a carefully crafted strategy in Assam — of bombarding top leaders’ speeches with nationalistic jingoism but not using it in the ground campaign. “The BJP has already established that Pakistan was taught a lesson. So we wouldn’t overuse it here, considering it may not resonate with the Assamese voter immediately,” said a well-placed BJP source in the state who did not wish to be identified. “This is why we don’t use it in our door-to-door campaign and local level connect with voters. Here we talk about development work, welfare initiatives and the local candidate,” the source said. However, the party believes at some level, it helps add to ‘brand Modi’ — its biggest trump card in the state. “BJP is seeking votes for Modi. In Assam, it is a brave decision to do so taking into account the mistrust Assam has had for national leaders. But this means BJP is sure of Modi’s image here and is using him alone in its branding confidently,” the source quoted above said, adding “the feedback was that even if it wasn’t an overt poll issue in Assam, Balakot was enhancing the PM’s image”. In fact, there are some voters who do believe it might help the party. “It certainly is helping BJP. Earlier, even if terror attacks like in Mumbai happened, the Congress did nothing. But BJP didn’t keep sitting and took a step, which everyone has appreciated,” said Kallol Saikia of Tezpur town. “Modi government has done a good thing, so some of those who earlier didn’t support it will also do so now. “I am still angry about the Citizenship Bill but I will support the BJP because it can protect our country,” Saikia added. Earlier in Nagaon, ThePrint had found a few voters who said they admired Modi for giving a “befitting reply” to Pakistan. The BJP also believes the issue will have greater and more obvious resonance among the urban population of the state, particularly the youth. Shri Nabojit Deka reflects the sentiments of most Indians on this issue. If the national security team is doing a good job, we should not even be aware that there is a problem.